When summer yields more vegetables than you can shake a stick at, it’s time to pickle. I adore pickles and for years shied away from trying to make my own. Why? Perhaps due to the time and labor, mixed with a little fear of failing. Well, quick pickling came to the rescue. For impatient types like me, this method requires minimal time and easy results. 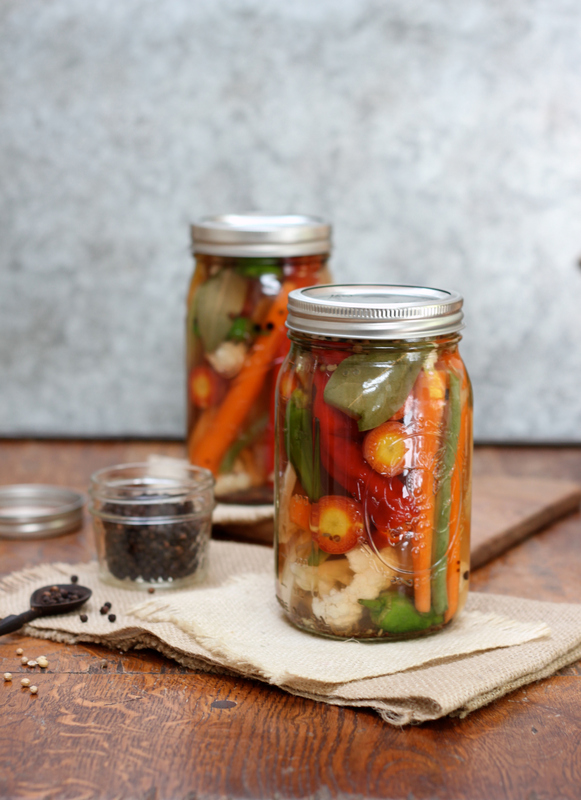 Shake up your pickles with a variety of veggies. Not only are they diverse to eat, they look very pretty in the jar. Small cauliflower florets, pardon peppers, baby carrots, green beans and fennel went into this mix. Of course you can also use cucumbers (kirby are best), zucchini, okra, or whatever else strikes your fancy. Wash and trim the vegetables as needed. Tightly pack into clear heatproof jars. Combine the brine ingredients in a saucepan. Bring to a boil, stirring until the sugar and salt dissolve. Pour the brine over the vegetables. Cover and cool to room temperature. Refrigerate at least 24 hours or up to 1 week. The flavors will develop with time. Three years ago I started making jam in the summer, but I’ve never tried pickles. The gorgeous photo and tangy brine recipe are tempting me to give it a try! Really so pretty – would be a great hostess gift. I’m posting my quick pickle recipe later this week. I am still waiting for the veggies to produce! I’ve got some small serrano peppers and green ‘maters, that’s about it. We had a very cold spring in the PNW and now it’s blazing hot in the mid-90s, I’m sure the plants are in a conundrum of how to produce anything. I really need to get on the quick pickling bandwagon….thanks for the inspiration! It’s definitely pickling time! I just ordered a bunch of jars from Amazon yesterday so I can start next week. They’re great to have year-round, and I use them as hostess gifts all the time.